Alex McDowell, RDI is British production designer and film producer. McDowell was born in Borneo to parents of English origin. He wanted to become a painter and studied at the Central School of Art in London. He founded Rocking Russian Design in 1978 and started his career designing album covers for punk rock groups. During the 1980s, he designed the sets for various commercials and music videos. McDowell has worked, among others, with directors Tim Burton, Steven Spielberg, Alex Proyas, David Fincher and Zack Snyder. In 2002 he won the San Diego Film Critics Society award in the Best Production Design category for his work on Minority Report and, in 2004, the Art Director Guild award for Excellence in Production Design for The Terminal. 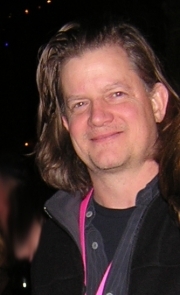 In 2006, McDowell was named Royal Designer for Industry by the RSA, the UK’s most prestigious design society, and was appointed Visiting Artist at the MIT Media Lab. McDowell is an advocate of immersive design and integrates digital technology and traditional design technique in his productions, creating a production design process that allows for the highest level of control over the look of the final film. Whole or part of the information contained in this card come from the Wikipedia article "Alex McDowell", licensed under CC-BY-SA full list of contributors here.